Bit - One character of data, such as a single letter or number, is called a Byte of data. A Byte of data is actually made up of 8 Bits of data in the form of a string of Zeros and Ones. Browser - The Browser is the Software Program that finds and connects your computer to a Web Site and then displays the contents of the web site on your computer's monitor. The 2 most commonly used browser proograms are Microsoft's Internet Explorer and Netscape's Navigator, known commonly as IE and Netscape, respectively. There are other browser such as Opera. With little exception, all browser programs perform the same functions. Byte - A Byte is one character of data, such as a single letter or number. A Byte of data is actually made up of 8 Bits of data in the form of a string of Zeros and Ones. Computer storage space and memory is measured in large numbers of Bytes. Computer hard drives originally held 20 Megabytes of data, but now can hold 80 Gigabytes, or more, which is 4,000 times more storage space than the old PCs! Computer memory originally held 640 Kilobytes of data, but now can hold 256 Megabytes, or more, which is 400 times more memory storage space than the old PCs! Cable, Cable Modem - Connecting to Internet through your local Cable TV company allows a very high-speed connection. A Cable 'modem' is not like a standard analog Modem. It is a device that goes between your computer and your Cable TV line, but the data remains digital at all times, so the 'modem' term is used for convenience only. For you to be able to subscribe to a Cable connection, you generally have to be a subscriber to your local Cable TV company. A Cable connection is usually 'Alway on', meaning if your computer is on, you are automatically connected to the Internet. Cable Download speeds vary greatly, but minimum speeds are 400K (400,000 Bits of data) or better, and more likely around 800K or more. Prices vary from $45.00-$60.00/month in addition to your Cable TV fee. Cable Internet is not used by businesses because it is not as secure as a DSL line. Cat5 Cable - Cat5 Cabling, which is short for 'Catagory 5', is the standard Network wiring that connects PCs to Hubs, Routers and Servers. The wire looks like a heavy telephone wire and contains 4 pairs of color-coded copper wire that have an RJ45 Jack connected at each end. An RJ45 Jack has 8 connections and looks like a wide telephone jack. The color-coded wires have to be in a specific order and need a perfect electrical connection. Content Provider - This is a general term for a Web Site that has a Search Engine as a main feature, along with free Email, News, Weather, Sports, Financial Info, White and Yellow Pages, Shopping, Calendar Organizers, Maps, Research, Instant Messengers, and much more. Behind the scenes, many Content Providers use the same resources. For example, most of their links to Maps connect you to MapQuest, or several of them use Google for searching. If you use several features of a particular Content provider, set that site as the Browser's Home Page. .com - Commercial, used by Stores, companies, etc. .org - Organization - used by non-profit groups, churches, etc. .us - Used by State Government agencies, where the Domain is actually the Country Code for the United States. An example would be www.mass.state.us. such as http://www.national-lottery.co.uk which is in the United Kingdom. .pro - Restricted, for Professionals such as doctors, lawyers, etc. You can specify .com, .net, .org, .biz, .info or .name depending on which is most appropriate for your web site. Domain Name - A Domain Name is the part of the Web Site address (URL) that identifies the web site's Name on a particular Domain. For instance, this site's Domain Name is pcvoyage.com. The 'www' part of a URL simply identifies the computer server where the web site files are located. Download - Downloading is a general term that means receiving data into your computer from another source, such as another computer on a local network, or from the Internet. When you connect to a Web Site, the Web Page files and images 'download' into your computer. When you save a file from the Intenret, as when you update your Anti-Virus program, you are 'downloading' the latest file. DSL, DSL Modem - DSL, or Digital Subscriber Line, allows a high-speed Internet connection over your telephone line. A DSL 'modem' is not like a standard analog Modem. It is a device that goes between your computer and your telephone line, but the data remains digital at all times, so the 'modem' term is used for convenience only. While on line, you can use your telephone or fax machine at the same time. This is because your voice is digitized and put on 1 'channel' on the line, and the data is on a separate channel. 'Always on', meaning if your computer is on, you are automatically connected to the Internet. This is more commonly used by businesses, less so for homes, because the cost/mopnth is much more. The connection is considered more secure than a Cable Internet connection. Internet Explorer - Click on Tools, then Internet Options. You will see the URL of the Home Page. Click on Use Current, meaning use the current Web Page as the Home Page. Netscape - Click on Edit, then Preferences, then click the Use Current Page button. Opera - Please Email info@pcvoyage.com the steps for Opera to PC Voyage, thanks. You can even choose to have a Blank Page as the Home page, but most users will set some Web Site. Your ISP might steer you to their Web Site as you connect, but clicking on the Home Button will take you to your selection. To confuse things a bit, the term 'Home Page' is also referred to as the main page, or the first Web Page you get to at any Web Site. That is why it might be better to use the term 'Main Page' for that. HTTP - Hyper-text Transfer Protocol - The protocol, or 'rules' used by web pages. There is a program called Trillian that ties many of the Instant Messenger services together. This is for users who regularly use 2 or more of the IM services. For example, if you use Yahoo, AOL and MSN Messenger services and alway have all 3 programs running, Trillian can consolidate all 3 into 1 window and connect to all of the services automatically when it launches. During installation, you enter your User Names and Passwords for all of your services. It will connect to them all and import all of your Buddy and Friends lists and display them as 1 long list in Trillian. Each entry in the list is color coded by which service the name came from. Trillian tries to carry the various IM proprietary options forward, so if there is a feature specific to AOL IM, you don't lose it in Trillian. However, there is a sacrifice - Trillian presently can not handle the more advanced features of the IM services, like voice and video. Trillian greatly reduces memory usage compared to the individual IM services. For instance, AOL IM uses about 5.8 Mb of RAM, Yahoo IM uses 6.0 Mb and MSN IM uses 6.4 Mb, totaling 18.2 Mb. Trillian, managing the same 3, uses only 8.4 Mb of RAM. Read a Review on Trillian Here. Internet - An enormous collection of Computer Servers and Routers connected together to form a World Wide Web (WWW) of networked computers. Information on those servers becomes available to almost anyone with a computer, almost anywhere in the world. ISP - An ISP is an Internet Service Provider. This is who you pay each month so that you can connect to the Internet. META NAME="Keyword" Content=" ...you will see the Key Words for that site. In Netscape, click on View then Page Source. Modem - Modem stands for MODulator/DEModulator and is a hardware device in your computer that lets you connect to an outside network, such as the Internet. The device converts digital data to an analog signal and outputs to your telephone line, which means you can't use your regular telephone while on line. Your ISP has banks of modems to convert the analog signal from many clients back to digital data and pass it on to the Internet. The common Protocol for modems is called V.90. This allows a maximum theorectical Download speed of 56K, or 56,000 Bits of data and a maximum Upload speed of 33K. In reality, download speeds are more like 38-48K, never reaching the maximum theoretical limit. The V.90 standard has been around for many years and speeds won't get higher, because to increase the speed would cause the telephone wire to begin to radiate an 'RF', or Radio Frequency, signal. The only change in modem technology to appear in many years is the V.92 protocol, which was made available in 2002. The 2 notable, but rather minor changes, allow faster Upload speeds and introduce a type of 'call waiting' that will put your internet session on hold so you can briefly take an incoming call. You could then choose to disconnect from the Internet and return the telephone call. See also DSL and Cable Modem. Network - A Network is created when 2 or more computers (or other devices) are connected together in such a way as to share data or hardware devices. The simplest network is made when 2 PCs are connected directly together. The 2 computers could share a printer or files that are on either PC. A more common way is to connect 2 or more PCs to a Hub or Switch. Likewise, Printers and Files can be shared and used by any of the computers on this small type of Peer-to-Peer Network, where each PC has equal status. 2 or more Networks can be connected together with a Router and all of the computers can then have access to the Internet. Now, what are the differences between a Hub, Switch and Router? Well, they operate at different 'levels' of networking, the Hub being at the lowest level. then the Switch at the next level, then the Router at highest level.The difference is in the way the data goes over the network. For example, say we have a network of 4 PCs and data has to go from PC #1 to PC #3. If a Hub and is used, the data goes down the network wiring to all of the computers because the Hub is not too smart and simply 'broadcasts' the data for all of the PCs to see. PC #3 sees there there is some data for it, so it accepts the data in. The other 2 PCs see that the data is not for them and don't let the data through. However, if all of the PC users are using the network, all of this data can slow things down. Using a Switch instead of a Hub will direct the data from PC #1 directly to PC #3, and no data will go down the wires to the others. This will make things work much faster. A Router connects one network to another. However, the same Protocols that allow the computers to see each other on one Network will not allow them to see the computers on the other Network. In this example, both Networks A and B can see the Internet, but need different protocols if they are to be able to see the computers on the other Network. In all cases, each PC needs a Network Adapter, or NIC (Network interface Card). The network wiring plugs into these. Wireless Networking is becoming more popular, and each PC needs a Network Adapter, Switch or Router that can transmit a radio signal in place of using cabling. Protocol - A 'protocol' is a set of rules. When used with the Internet, it is a set of rules for how connection is made and how web page information is sent over the internet. HTTP is the protocol for web pages. Protocols for Modems define how data is converted, compressed and packaged to travel over a telephone line. Router - A device that works with many other Routers to connect a computer to a server and to route data around the Internet. There are thousands of Routers around the world. A Router is also used on your LAN (Local Area Network) to protect it from intrusion from the Internet. Search Engine - A Search Engine is a Web Site that focuses on searching the Internet for other Web Sites containing information that you are looking for. Search Engines seek out relevant sites based on matching your search words with Key Words that are embedded into Web Pages or located within the content of a site's Main (or Home) Page. Search Engine sites generally do not contain other features like a Content Provider, but many Content Providers use the services of Search Engine sites. If you don't find what you are looking for with one Search site, try another - you will get many different "hits". Also, some Search Engines use multiple other Search Engines to ensure the best possible results. Server - A Server is simply a computer that is accessible by other computers and is a central storage point for data to be shared. Most companies now have a Network for their business data, files and programs. A Web Server is a permanently set up computer where Web Pages are kept and maintained for access by someone using the Internet. Telling you 'It may take up to 72 hours' for your address to be removed. in reality, they could remove your address instantly, but instead, they give themselves time to pass it on. System Tray - In the lower right corner of the Desktop, at the right end of the Taskbar, is the System Tray. You will see small icons and the computer's clock. To many, these are mysterious icons, but in reality, these is no mystery at all as to what they represent. Move the Mouse pointer over one of them and pause, not clicking any buttons. You will see a descriptive "tag" pop up over the icon. 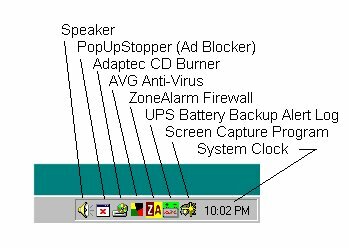 These System Tray icons generally represent small programs that loaded into memory after Windows finished loading. The instructions that cause these to load are in a few different places. The Speaker icon is there because in Control Panel | Multimedia there is a checkbox (if the computer has a Sound Card installed). You might see a Mouse icon, which is there because the Mouse has special features, such as a wheel, and has its own program. Anti-Virus programs will automatically load in the Boot up procedure, so they can guard your computer against viruses. (Usually, the only way to prevent an anti-virus program from loading is to uninstall the program from your computer). Other icons represent programs that are in the Startup Folder. The computer's Clock is on the far right. If you pause the mouse over the Time, it will show you the Date. The time displays because of a Check Box in Taskbar Properties. Upload - Uploading is a general term that means sending data out of your computer to another source, such as another computer on a local network, or to a Server on the Internet. When you attach a picture file to an Email and send it to your friend, you are 'uploading' the file from your PC. Web Page - A web Page is one page of a Web Site. It contains the code that your Browser interprets to display text, images, and data to your computer's screen. Web Site - A Web Site is a collection of Web Pages and files residing on a Web Server. As you browse around the site, information on the site's various pages go across the Internet to your computer. Web Site Host - The Web Site Host is the person who own's, operates, and maintains the Web Server where the files for a Web Site reside. The Host also maintains a permanent connection to Internet Routers. The Web Site Host does not necessarily maintain the Web Site content or files, just the computers.